State weather bureau earlier said that tropical storm Lawin intensified into Typhoon on Sunday afternoon. 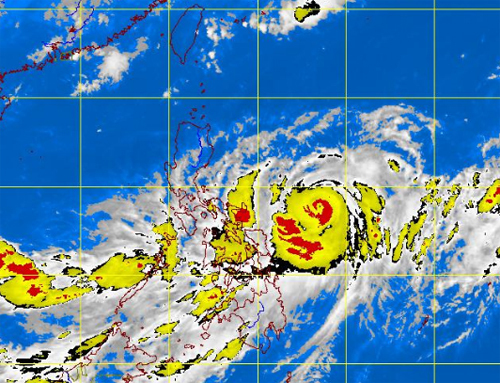 PAGASA raised public storm signal no. 1 in Eastern Visayas. PAGASA weather bulletin as of 11 a.m. advisory said Typhoon Lawin moved closer to the Samar provinces and was estimated at 330 km east of Borongan in Eastern Samar as of 10 a.m.
PAGASA also said, "Typhoon "LAWIN" continues to intensify over the Philippine sea." Meanwhile, PAGASA still advised fishing boats and other small seacraft not to venture out into the eastern seaboard of Southern Luzon, Visayas and Mindanao due to big waves generated by Typhoon Lawin. Comments or suggestions about "Typhoon Lawin Latest Update - September 24, 2012" is important to us, you may share it by using the comment box below.